So remember this post? Well, you can forget the whole thing. After much distress, and arguing between the sales department, I have cancelled my order. Since when did they not have to tell you about a product being on back order ... especially if they don't believe you will get the item until June? Ummm, I don't think so! So, I am on to plan B. Don't ask me what plan B is yet, but I assure you, it will be better than plan A ... at least I am hoping so. I am thinking about doing something similar to this post ... I am in love with the look, but I am thinking it looks REALLY hard, even though she says it's super easy ... don't get me wrong, I am all for a challenge. As far as the bedroom update, I am still sleeping on the floor. I was really thinking I would not be at this time, but seriously, Ryan hasn't touched the bed in over a week ... it may be a while people! In other news, we have been looking at a certain house around town. We have been there a few times, and we're thinking about putting in an offer. We will see, it needs some work, but all things that we can do. Really, the house is just full of potential ... I am starving for potential! Hopefully something happens soon ... I am tired of the floor! 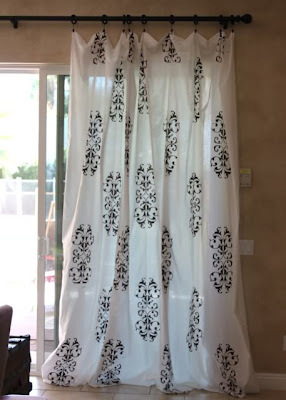 love these drapes! they are gorgeous!